If you’ve been thinking about upgrading your current HVAC system, now is the time to act! 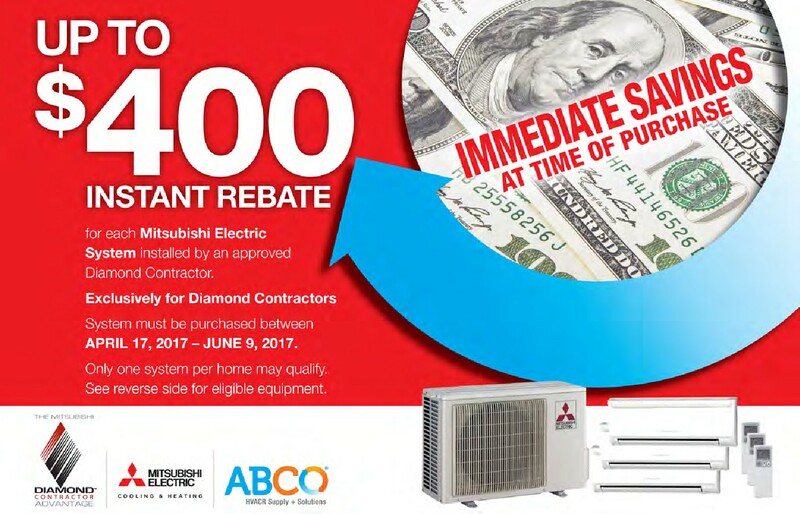 For a limited time, the team at New England Energy Concepts in North Dighton, MA, is offering a fantastic instant rebate when you purchase a Mitsubishi Electric system and have it installed between now and June 9. Valid from now until June 9, Mitsubishi Electric is offering New England Energy Concepts customers an exclusive deal on all electric HVAC systems. If you purchase a heating and cooling system and have it installed by an approved Diamond Contractor, you will receive up to $400 off in an instant rebate. Only one system per household will allow you to qualify for this deduction. For over 28 years, New England Energy Concepts has been the premier provider of top-quality HVAC and electrical services for residential and commercial customers. Their team of technicians are up-to-date on industry knowledge and equipped to handle any maintenance or installation so you can save money and stay cool all summer long. Call Today to Schedule Your Mitsubishi Electric HVAC System Installation! For more information about this incredible offer or to schedule an installation for your electric heating and cooling system, call New England Energy Concepts today at (508) 509-2711. You can also visit their website to learn more about the company and their comprehensive list of services, and connect with them on Facebook.